Message 301 - Posted: 10 Nov 2007, 6:06:25 UTC - in response to Message 283. Message 304 - Posted: 10 Nov 2007, 8:26:32 UTC - in response to Message 283. My apologies for this question as I am a relative newbie to BOINC. Where and how do I read these stats. My clients are managed by BOINCstats BAM but I do not see this project listed in the available projects. Do I need to do something at my end or in time this will happen auto magically? Message 305 - Posted: 10 Nov 2007, 9:55:18 UTC - in response to Message 304. In this thread, we are talking about seeing stats for this project here on this web site. Go to the home page and see the links under "Project totals and leader boards". As for third party stat sites, it is up to the admin at each site to add the stats from this project to their sites. The stats are not being updated every 6 hours, if the timestamp on the files in the stats directory is a fair indicator. Mod date currently shows Nov 12 @ 12:14; before that it was Nov 10 @ 12:20. The stats on the website itself are being updated ok as far as I can see, though personally I think they should be updated hourly. The xml stats files are not being updated at all, I suspect the cronjob to run them is incorrect. I would suggest this is scheduled to run every 6 hours or so..
i'm going to get our labstaff to look at why these aren't updating on time (even though they're in the boinc config.xml file) hopefully we'll get this fixed soon. same with my signature on BOINC synergy. This project is a really great project that has made amazing progress in a short amount of time. Automatically updating the XML stats and some news on the front page on how we are doing would be good next steps. Message 481 - Posted: 17 Nov 2007, 15:12:21 UTC - in response to Message 475. We've got a lot to update, and I would like to run a couple things by some other members in the group to give everyone a better idea of what is going on. Actually as far as a stats xml update goes, the files should not be much bigger for a weeks update than for a days....just the new users signed on will make it a bit bigger. Message 482 - Posted: 17 Nov 2007, 17:24:52 UTC - in response to Message 481. "Actually as far as a stats xml update goes, the files should not be much bigger for a weeks update than for a days....just the new users signed on will make it a bit bigger." Because crunchers are competitive, xml stats should be updated (automatically so you don't have to worry about it) at least once every 24 hours - many projects do it more frequently. This is not only so that crunchers can reflect their credits but it also gives transparency to the project as a whole as to the number of people participating, how much data is crunched, etc. Getting the xml stats up was a big first step. Getting them to update automatically, putting some news on the front page, and eventually getting a graphic would be excellent next steps to prepare for dramatic growth. Please fix the xml stats. Still working on this. are there any tools out there where i can use the exported stats so i know that i've updated them correctly? Message 494 - Posted: 18 Nov 2007, 16:54:38 UTC - in response to Message 491.
shows that they have updated... my scripts check once per hour for the value of last_update_time in tables.xml having changed. If it has they download and parse the rest of the files.. 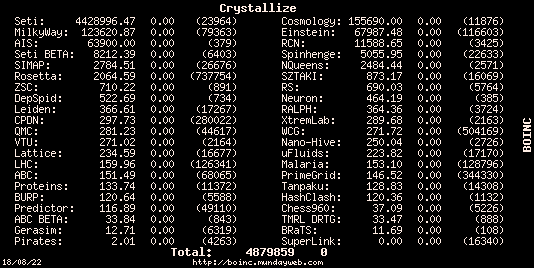 Both individual and project stats are updated in BOINC Synergy. Hopefully, it is automatic so you can go on and do other things. Keep up the good work! Any chance we see an update soon?